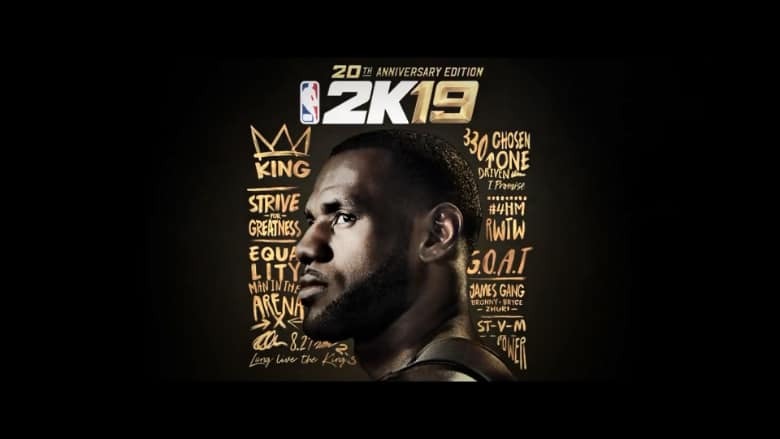 NBA 2K19 20th Anniversary Edition Cover Goes to LeBron James | Nerd Much? 2K is ready to get into the promotional swing for September’s NBA 2K19. The studio has dropped the game’s first trailer, a release date, and confirmed that The King, LeBron James, will grace the 20th Anniversary Edition’s cover. The 20th Anniversary Edition of the game releases on September 7th, 2018 – 4 days earlier than the Standard Edition. Physical add-ons include a NBA 2K19 LeBron James poster, a NBA 2K sticker sheet, and a custom wristband with LeBron’s cover words. There are a slew of digital items included too with the Anniversary Edition. 100,000 Virtual Currency, 50,000 MyTeam points, 20 MyTeam League Packs, a Sapphire LeBron James MyTeam Card, 10 MyTeam Heat Check Packs, 5 LeBron-themed murals for MyCourt, a LeBron MyCourt design, and the King’s Collection which includes Nike LeBron apparel and 25 pairs of footwear. NBA 2K19 will once again roll out to Xbox One, PlayStation 4, Nintendo Switch and PC this year. The Standard Edition of the game will launch on said systems on September 11th, 2018. Players can download the all-new NBA 2K19: The Prelude MyCareer experience early on Xbox One and PlayStation 4 August 31st.